I’m a bit of a news hound; while at work, if it’s slow, I’ll check out Facebook for anything my friends deem worthwhile. At lunch, before and after work, I’ll be scrolling and refreshing through Google News to see what the latest is. Needless to say, I had a rather cruel awakening while going through my news feed this morning and coming across this article, talking about how the U.S. government, less than 12 hours into their trade war with China, is already looking at issuing a bailout for the farmers that will be affected by it. It’s nowhere near the $700 billion bailout we gave the auto industry, but I’m sure whatever estimates there are for “potential damage” are anemic at best. Here’s the real point I want to make: Trump, in all his bombastic retardations, has extolled the virtues of a trade war for months. He’s been hellbent since day one on declaring war; preferably military, but it seems the best he can achieve for now a trade one. Today, as of midnight, the first tariffs have been imposed against China, which means the trade war has begun. What no one seems to realize, for some bizarre reason, is that the United States can no longer be a self-reliant country. We have changed from a producing country to a consumer country, all in a span of 50 years. Our unbridled desire to buy blue jeans for $20 has pushed manufacturing overseas; it was never immigrants taking our jobs, it was us handing them out to the lowest bidder. But in doing so, we’ve actually eliminated our own customer base, which is in fact our employees. It’s a vicious, self-defeating cycle, really. Our capitalist economy has been such that in order to make things affordable for ourselves, someone else has to make them. Which means we lose jobs, which in turn means we lose the money needed to buy the things other countries produce for us. By imposing tariffs on imports from other countries, we’re not “saving American jobs”, we’re guaranteeing that the poor and lower class (and what’s left of the middle class) lose whatever buying power they had. 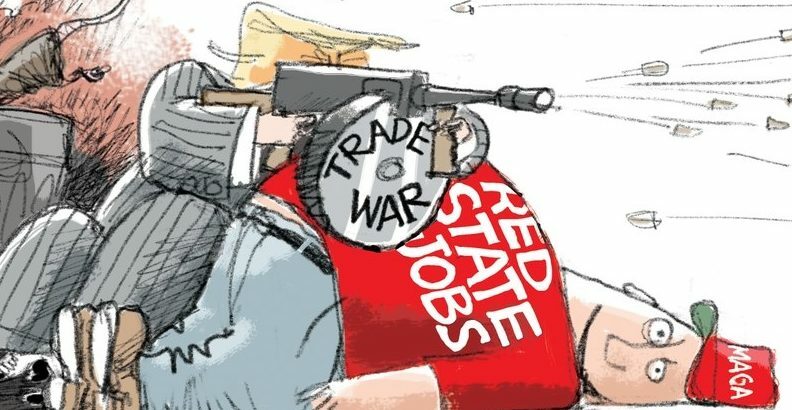 The tariffs aren’t so high that companies will stop outsourcing. Some, in fact, like Harley Davidson, have completely moved some production overseas because of it. Even with 25-50% taxes imposed, it’s still cheaper than having things made in the U.S. This means while no one is getting more work, we are paying more for everything. As I mentioned, less than a day into the trade war, Trump’s administration is already looking into bailouts for the farmers that will be affected. Read another way: Trump’s administration KNOWS THEY FUCKED UP. If they’re already working on bailouts, even before they’re needed, this means they know good and well that what they did is going to backfire. You do NOT look into bailouts if a trade war is what you wanted, if you thought a trade war is what’s best for the country. You look for a bailout when you’re in trouble, when something has gone so awry that you need to “stop the bleeding”, so to speak. Yesterday, Mexico imposed a second round of tariffs against the U.S. in response to the Trump administration imposing tariffs on Mexico. Europe is also facing tariffs. Pretty much everyone the United States has worked so well with for the past 25 years is being penalized for doing business with us. And as childish as it seems, these countries are doing the same in retaliation, but in actuality, I think they’re doing it because they know we won’t survive for long without their exports. The rest of the world has, well, the rest of the world to find alternative sources for their material needs. I believe Europe bought 66% of the soy beans produced in the U.S. (don’t quote me on that), surely they can find other sources for that, even if they have to buy them from multiple countries. We, on the other hand, are spitting in the face of the rest of the world, and will not be able to find “alternative sources” to sell our soy beans (or anything else we produce) to, the way we are going. Surprise, surprise! Not only has the Trump administration officially announced their bailout plans, but they’ve actually reduced the amount. The original amount was a paltry $30 billion, and now has been reduced to $12 billion. This tells me that the administration is having a hard time finding money available to be re-assigned (or they’ve erroneously convinced themselves that the trade war’s effect is less than it truly is).